Every top manager or managing director of a company must hope that among his employees and business colleagues there is a high flyer. Moreover, when such a person does emerge from the pack, how is he or she to be recognised and thanked? With this in mind, we have chosen to call one of our everyday ecards "Top Gun". The front page of this card shows a picture of a highflying powerful jet fighter high in the sky. 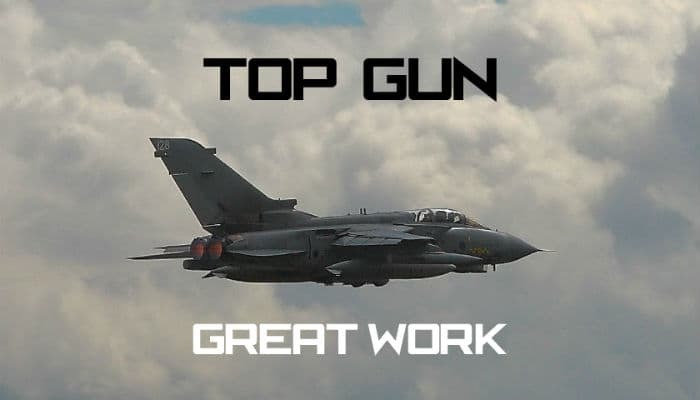 It carries the title of “Top Gun” and adds the simple message “Great work” at the foot of the card. However, there is space for an additional message to be added. Extra space has been provided on the reverse of the card for further text and logos. These delightful cards can be sent out whenever a high-flying employee or colleague makes himself or herself noticed. The Top Gun message and other every day ecards can be sent out on the right occasion at any time of the year. However, there is only one time of the year when you need to send out corporate Christmas ecards. In the hectic run up to Christmas, time must be found for the posting and addressing of numerous envelopes, and we are aware of the financial strain this task puts on a company both in cost of materials and lost time. That is why ecardshack has produced a range of e Christmas cards for business. Once you have picked the design and message you want on your card, you just e-mail them to all your clients, employees and other business associates. No need for envelopes or stamps, just send e cards.